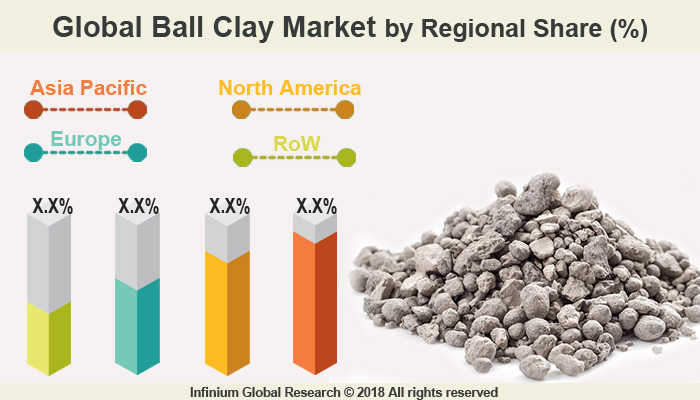 A recent report published by Infinium Global Research on ball clay market provides an in-depth analysis of segments and sub-segments in the global as well as regional ball clay market. The study also highlights the impact of drivers, restraints and macro indicators on the global and regional ball clay market over the short term as well as long term. The report is a comprehensive presentation of trends, forecast and dollar values of global ball clay market. According to report the global ball clay market is projected to grow at a healthy CAGR of over the forecast period of 2018-2024. Ball Clay is fine textured clay used in the manufacture of ceramic and pottery applications. These clays are highly valued clays and owing to the properties of plasticity and strength they are used in ceramic bodies and in many other industries. Ball clays contain three principal minerals such as mica, quartz, and kaolinite. There are other additional minerals and some carbonaceous materials that are derived from ancient plants. The general properties of ball clay include moisture content and are available in different colors such as pink, different shades of black, brown and gray, and tan. Contamination minerals found in ball clay generally contain gypsum, pyrite, dolomite, titanium and iron oxides. Ball clay is used after mixing with non-plastic clay to impart the desired plasticity in porcelain, refractory materials, and pottery. Ball clay helps in the preparation of enamels, glaze and for transmitting a dense vitrified body. Due to its better tensile strength and shrinkage than other clays the usage of ball clay is increasing in ceramic and pottery application and this factor drives the demand for ball clay market. Furthermore, growing investment in the construction industry globally, the use of tiles for the floors and walls are growing that result in the upsurge consumption of ball clay. This is another boosting factor for ball clay market. Additionally, growing usage of ball clay in amenity, construction industry and in agriculture, the market for the ball clay will display strong growth. Besides, the use of ball clay as fillers and extenders in adhesives, polymers, insecticides, sealants, fertilizers, and plastics the opportunities for the market seems to be more beneficial over upcoming years. Among the geographies, the Asia Pacific region dominated the global ball clay market. Factors such as the growing construction industry and population across countries such as India, China, and Indonesia, the usage of ceramic is growing in the Asia Pacific region. Furthermore, growing usage of ball clay in non-ceramic applications such as automotive, electrical & electronics, the demand for ball clay in increasing and thus, drive the growth of the ball clay market in this region. The report on global ball clay market covers segments such as end-use. On the basis of end-use, the global ball clay market is categorized into non - ceramics and ceramic. The countries covered in the North America region include the U.S., Canada, and Mexico; while Asia-Pacific includes China, Japan, India, South Korea, Malaysia, and among others. Moreover, Germany, U.K., France, Spain, and Rest of Europe are included in the European region. The U.S. drives the growth in the North America region as it is the largest market in the region. The Asia-pacific region offers a substantial potential for the market growth owing to rapid growth in markets such as India and China. The APAC region is projected to experience a growth at a CAGR of x.x% over the period of 2018-2024. The report provides profiles of the companies in the global ball clay market such as Ashapura Minechem Ltd., Sibelco, Mita Madencilik Ltd.Sti., JLD Minerals, Imerys Ceramics, G&W Mineral Resources, Ashok Alco - chem Limited, Old Hickory Clay Company, Karimulla Ceramics and Jayesh Mineral Industries. The report provides deep insights into demand forecasts, market trends, and micro and macro indicators. In addition, this report provides insights into the factors that are driving and restraining the global ball clay market. Moreover, IGR-Growth Matrix analysis given in the report brings an insight into the investment areas that existing or new market players can consider. The report provides insights into the market using analytical tools such as Porter's five forces analysis and DRO analysis of ball clay market. Moreover, the study highlights current market trends and provides forecast from 2018-2024. We also have highlighted future trends in the ball clay market that will impact the demand during the forecast period. Moreover, the competitive analysis given in each regional market brings an insight into the market share of the leading players. This report will help manufacturers, suppliers, and distributors of the ball clay market to understand the present and future trends in this market and formulate their strategies accordingly. Get free analyst support for the queries before and post purchasing report. Be assured of 100% customer satisfaction about the research and get 24X7 customer support. Infinium has achieved over 400%+ growth in its repository and revenue over the last 2 years. Yes, we are proud to say we are growing at a great pace and becoming a trusted partner among our clients.